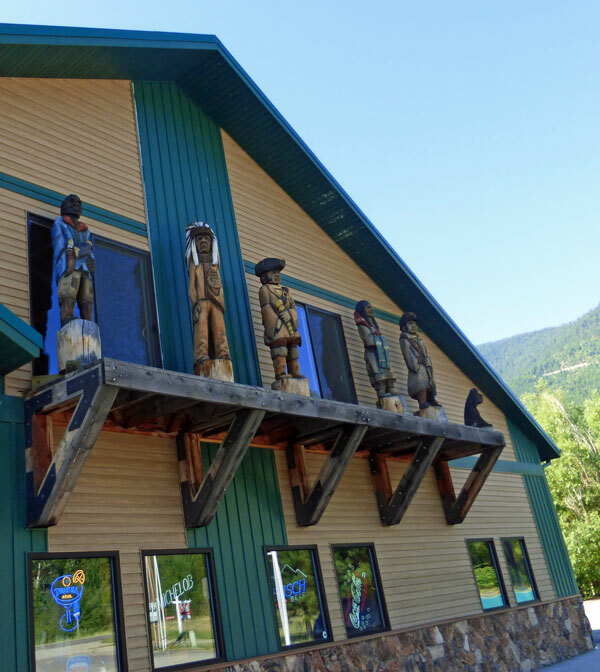 We finished the next segment of the Northwest Passage Scenic Byway, (U.S. Route 12), and found ourselves making a right turn onto 93 in Lolo, Montana. From here there was a straight run to Darby, Montana. Just because the road was straight, didn’t eliminate the possibility of beauty. There were little towns, and big horizons, all new to us. Kim illustrates the contrast between the old and the new. 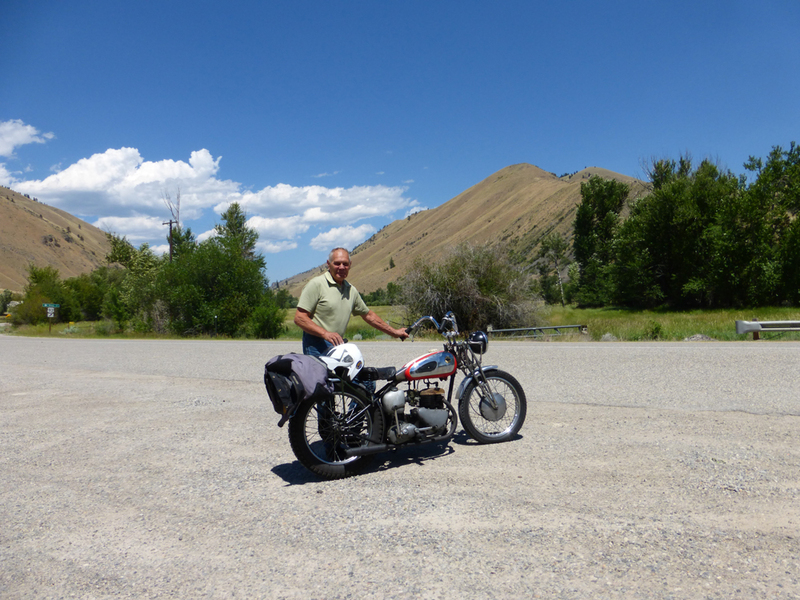 After Darby the road climbs up to Chief Joseph Pass (elevation 7, 364 feet) and the border into Idaho. Then the road winds its way down to North Fork. Terry in North Fork. I wanted to get a video of him starting this bike. He ran alongside to bump start it. Cornering is a special challenge on motorcycles. Elevation changes, and distractions such as stunning views, rocks in the road, and oncoming traffic are part of the mix. If I’m not in my zone or feeling the syrup of wahoo, I just slow down and focus on being smooth. However I’m always trying to improve my riding skills. Sometimes I play with throttle control, or lean angle or how to read a corner. No where on this trip did we run into tight switchbacks, but the big sweepers with changing elevation gave me plenty to think about. 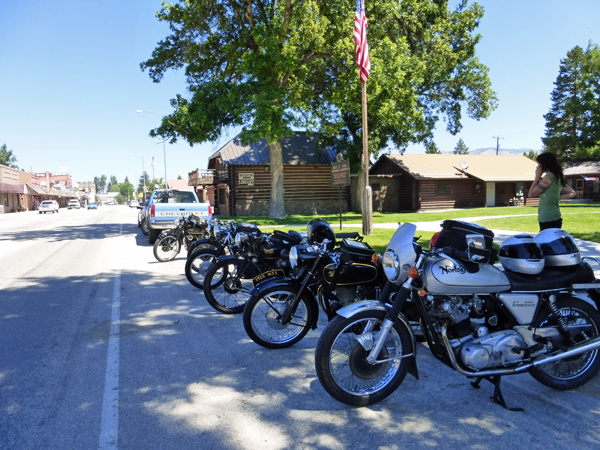 I was doing the latter when I noticed three modern Harley’s behind me. They passed me, but then I found I was keeping up with them. One slowed down and gestured for me to pass him. Hmmm. Now I was in the middle of their group. Then the two in front of me pulled onto a wide spot on the shoulder. I don’t know what the road etiquette is for this situation, but I wasn’t riding to meet anyone so I sped up and stayed alone until I reached North Fork where my riding partners were swapping stories and eating ice cream. 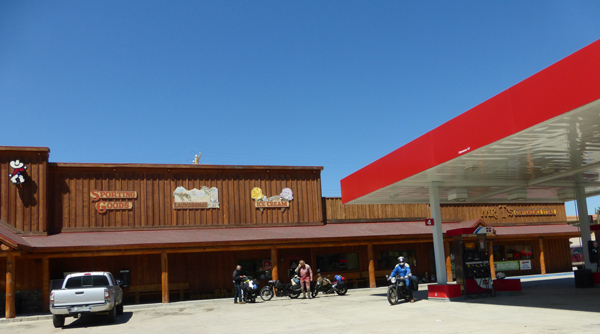 It was while we were finishing our ice cream that stories of a rider down came trickling in. Later we learned that Jim A. had some how “got into the marbles,” the gravel on the outside of a corner, and low-sided. 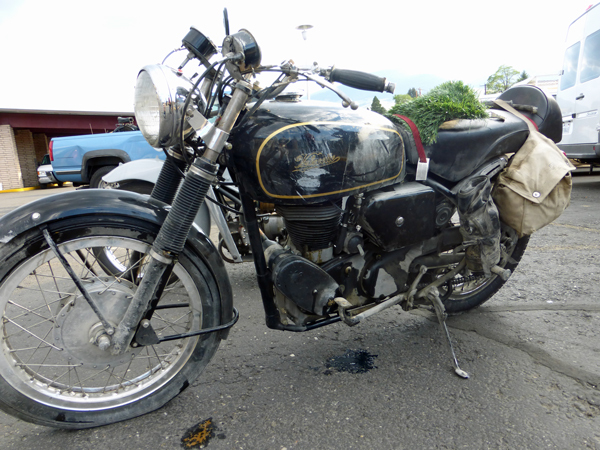 The bike was dragged back, but Jim went on to the hospital, first in Hamilton and then transferred to Missoula. He had to have an operation on one ankle and stiches in a knee. We hope for a smooth recovery. Scratched and scraped, but repairable. 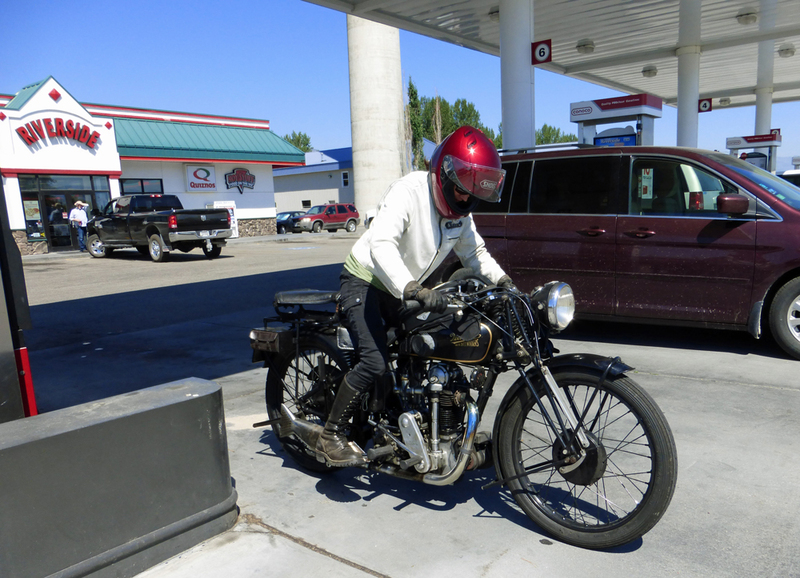 This entry was posted in Uncategorized, Velocette & other British Motorcycles and tagged Idaho motorcycle ride, Lanora Cox, Velocette, vintage motorcycles, VOCNA. Bookmark the permalink.